Is voltage drop in DC cabling a problem? The simple answer is yes, voltage drop in DC cabling can cause significant problems for low voltage LED or compact fluorescent lighting and other connected equipment such as freezers or cooler units. We recently had a customer enquiring if we could help him with a problem he was experiencing with his 12v remote area Solar PV/Battery powered LED security lighting. The customer explained that the symptom was that his 12v 30w LED floodlight was constantly cycling in assort of slow motion flicker whereby they would illuminate to full brightness for a few seconds and then go out. After checking the battery voltage and finding his battery was reading okay at 12.5v he decided the lamp must be faulty. We asked what cable was being used and how long the cabling install was from battery to lamp. 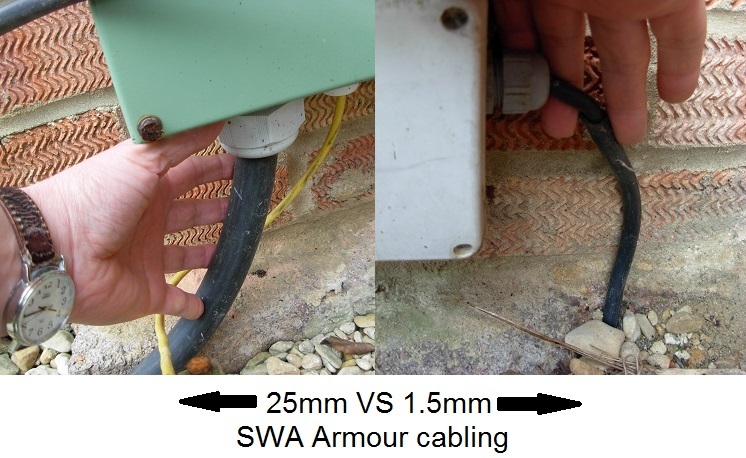 It quickly became apparent that the cable was simply not up to the job as he further explained that he was using high grade SWA ‘Armoured cable’ of 1.5mm over the ’30 meter’ distance. We advised that there was significant voltage drop in this length of cable of around 2.5V. The cable was simply too small to carry the meagre 12v supply to his powerful 30W DC LED floodlight over the 30m distance. In order to reduce the loses to a more manageable level he would need to upgrade to 4mm or better still 6 or 10mm cable. The minimum 4mm section copper cable would just about be sufficient (with a nominal 1V drop over 30m) to keep the lamp running without faltering. However, if the source voltage was prone to falling below 12v then the problem could appear again intermittently, especially when charging power had been lower or reduced due to overcast conditions, etc.. A better solution would be to employ 6mm or 10mm 2 core SWA cabling as these choices would present a far lower voltage drop of 0.63v or 0.38v correspondingly. With a constant voltage power supply calibrated and monitored by a certificated voltmeter to read 12.1V at source, we then connected the ‘1.5mm’ cabling and again took readings at the other end exactly 30 meters distant. With NO LOAD whatsoever we found the voltage was reading 12.09v – not bad. Then we connected the exact model of 30W LED lamp at this point and the reading plummeted to 10.0v whereupon the lamp was so starved of power the internal electronic circuit switched the lamp off. Power then rose to 12.09v again and the lamp once again began to illuminate, power instantly drops and the lamp goes out, etc, etc. We repeated the experiment only this time with some fabulous 25mm section armour cabling and the same power supply conditions (at 12.1V regulated constant voltage). With no load at the 30 meter distant end, we measured exactly 12.1v – excellent. Once again, we connected the 30W LED floodlight and watched the readings change…. Voltage began to drop as the LED driver powered up to full power and the final reading right there at the input to the floodlight was 11.78V which is absolutely fantastic. The total load of the floodlight is 33 watts. If the above circuit (as the customer had detailed) was for a solar PV to battery cabling feed, the voltage loss for charging would have been so severe as to have rendered the PV array next to useless. The message is clear; If you want excellent results from your solar PV system or DC lighting install Do not skimp on cable ratings. So what were the customers options? Our favourite was to replace the 1.5mm cable with 6mm twin core minimum. However we also asked if the cable run could be reduced and at the same time perhaps the lamp could be re-sited t shorten the cable run. Another good option would be to purchase a good quality cable ‘off cut’. Often good quality SWA armour grade 2 core cabling is available either as clearance and can often be purchased at a much lower rate than fresh, right off of the drum.